Besides Rome, Venice has to be one of my favorite cities in Italy. Before I went for the first time, some fellow travelers brushed Venice off as being “cheesy” and “overrated.” After spending a few days there, however, I had to disagree. I’ve been about three times now, and each time the city seemed even more beautiful and more intriguing. With its winding canals, ornate gondolas, and gilded palazzi, Venice is truly unlike any other city in the world. Its history alone is fascinating. The city was built on several islands of a lagoon, which were then linked by bridges that you can still cross over today. Venice was the cultural, artistic, and political powerhouse of its time, serving as the hometown of both the great explorer Marco Polo and the infamous womanizer Casanova (born in Venice in 1725). The city withstood plagues, became part of the Hapsburg Empire after being defeated by Napoleon in 1797, was spared during World War II on account of its beauty, and faced rising water levels and flooding as the city’s marble foundations sank further into the marsh. Speaking of sinking, one must only look at the water lines on Venetian stoops to see the dramatic evidence of rising water levels. Steps that were several feet above the water centuries ago are now submerged. According to National Geographic, Venice dropped about five inches between 1950 and 1970, and while the city now sinks at a rate of less than two inches every 100 years, the surrounding Adriatic Sea continues to swell and causes more threats of submersion. Under a new plan to save Venice, Italian hydrologists would inject billions of gallons of seawater to try and “inflate” porous sediments under the city. Hopefully, this would cause Venice to rise by as much as a foot and would create a more stable foundation for existing buildings. The trick is that Venice has a layer of clay under it, and therefore the injected seawater would spread out underneath the clay and cause a lateral elevation. The method of “subsurface fluid injection” has apparently been used to California, Canada, and other places to lift up sagging land, and experts are optimistic that this experiment might dramatically help the city. According to National Geographic, tourists don’t really mind the flooding in places like Piazza di San Marco (although I’ve been there when it has flooded, and it was scary to see how quickly the piazza was submerged), and Venetians are used to the acqua alta (high water), but the concern is that over time the flooding would become more catastrophic. Venice is a truly remarkable city, and although its mask is a bit dulled from time and wear, you can still see the glimmer of gold in its countenance. It will be interesting to see if the fluid injection experiment goes forward, and whether or not progress is made. Either way, I don’t think that anyone wants to see such a beautiful city sink past the point of no return. Each new year brings a new discussion of what hot spots travelers should pay attention to. There are lists floating around the Internet of what cities to visit, what beaches to frequent, and so forth. I often find myself feeling like the lists miss out on some great destinations, which is no surprise given how subjective travel lists are. After reading Frommer’s list for 2012, I liked several of their suggestions (Beirut, Ghana, the Yucatan Peninsula), but wanted to add some of my own “hot spots” for 2012. 1) Dublin. I spent a few days in Dublin several years ago and fell in love with the easygoing, friendly locals (most likely laid back on account of how many Guinnesses they can put away before 10 a.m., but no matter). After feasting on some incredible Irish stew with soda bread, it’s easy to arrange a tour to take you out to the emerald hills and waterfalls that make Ireland so breathtaking. 2) Dubrovnik. In recent days, Croatia has been touted as an “up and coming” tourist destination, on account of its great location on the Mediterranean but cheaper prices than other European countries. Some friends of mine visited recently and reported back that Dubrovnik is a great combination of quaint history and emerging modernness. 3) Tahiti. Leon and I are spending our honeymoon in French Polynesia, and I am counting the days–I developed a fascination with the islands back in college after seeing pictures of the bungalows suspended over turquoise water. The area is also famous for its vanilla and black pearls, not to mention that Tahiti hosts a Paul Gauguin museum chronicling the intriguing life of the artist who left his family in Paris to morph himself into an islander. 4) Tel Aviv. It has always been a dream of mine to make it out to Israel at some point to visit the Holy Land, and to experience Tel Aviv. Known as the cultural capital of Israel, the city has everything from beaches to the famous Old Jaffa neighborhood to incredible museums. 5) Auckland. New Zealand has the whole Lord of the Rings-esque scenic beauty, to be sure, but I mainly want to visit because all of the New Zealanders I’ve met are just so cool. When I lived in Korea, I worked with several New Zealand natives and loved them to death. They love their homeland, and after seeing one picture of Auckland, my attention was captured. 7) Colorado Springs. Obviously, the U.S. has incredible travel destinations that bring in tourists from all over, so I had to include a great American city in my list. Leon and I have spent time in Colorado recently, since he hails from Pueblo, and we took time over the holidays to meet up with some of my college friends in Colorado Springs. The snow-capped mountains were breathtaking, and the view of Pike’s Peak does not disappoint. There is a cute downtown area where we grabbed some fondue one evening, and I remember being impressed with the city’s laid back, fun vibe. These are just a few suggestions for 2012–I’ll of course be interested to see what locations emerge as promising destinations as the year goes on. In the meantime, happy travels! Needless to say, as someone who has visited London several times and attended graduate school there, I was alarmed to hear the news of recent riots that have spread around the city and even other parts of England. London is a vibrant city, with such a mix of historical uniqueness and modern flair, and it is quite disturbing to see what is happening this week with the senseless, aggressive violence committed so vagrantly by out-of-control thugs. The news is awash with chilling photos of British citizens, innocently trying to get home, being forced to strip down in broad daylight and being robbed by masked hooligans who have no concern for basic decency. Numerous stores have been looted, and fires are being set everywhere. I saw one photo of a woman jumping out of a burning building into safety, and it left me speechless. And to add insult to injury, several British politicians are trying to blame the current economic difficulties and attempts to cut spending as justification for why these crooks are “understandably” acting out. Thankfully, many Londoners are trying to fight back. They are using Facebook, Twitter, and other forms of social media to band together to do good things, instead of using them for evil as the hooligans did. I read one story about people coordinating cleanup efforts to try to undo some of the catastrophic damage that British officials are already estimating will cost a fortune to remedy. My friends in London assured me that they are fine, but they are definitely laying low and are being extra careful. It cannot be assumed that even the most “posh” of neighborhoods in London are immune to the violence. Right now it seems that everyone is scrambling to get home, hoping that the police will continue their diligence in combating this wave of senselessness, and looking to make sense of a situation fueled by chaos. Hopefully the city known for its culture of politeness will return to stability soon, and those who have injured so many with their cruelty and anarchic ways will be held accountable. After Leon and I got back from a wonderful weekend in Houston with my grandfather, parents, and a few aunts/uncles/cousins from the Douthit clan, we both jumped back into work. Even though we’re in completely different professions, our colleagues and everyone around us in D.C. were talking about the debt ceiling agreement and the stock market. For my job, I also had to do a little analysis work on the current economic conditions (scary). Which, in an indirect way (and probably to try and cheer myself up) made me think of non-stock related marketplaces in the U.S. and around the world. With all of the talk about GDP, enormous debt, high unemployment, and so forth, all of the numbers and statistics being thrown around can be overwhelming. For a smaller economic microcosm that’s easier to digest, however, one need only look to a marketplace. Whether visiting a market in your neighborhood or a bazaar in some exotic location, the economy of culture is alive and well everywhere. My mother first introduced me to markets as a child. She was an antique collector, and to make extra money she would sell her finds at a local shop in McKinney. I remember dreading the early Saturday mornings when we’d head to McKinney Trade Day or other markets to scour the booths for treasures. Now, as an adult, I love going to markets. Markets are fascinating snapshots of the local culture. You can gain great insight into how locals live, what kind of food they like, what they consider to be worth selling, and what social mores exist within that particular environment (yell while bartering in Egypt and you’re normal, yell while bartering in Texas and you’re crazy). They’re also a lot of fun. Whenever I go to a new country, I try to check out the main market and usually make a Saturday of it. In my mind, there’s nothing more fun and relaxing than poking around a market with some treats to nibble on and interesting people to watch. (I also began a jewelry collection from my market experiences, so if I have a daughter she’ll have to listen to plenty of stories about where Mommy bought such and such necklace). I still think back fondly on the times when my parents, brothers, and I would go to McKinney Trade Day, and I hope to take my family to markets one day. I’ve listed some of my favorite markets around the world–I definitely recommend each of them if you want a unique, “culturally economic” experience. Madrid, Spain: El Rastro. Literally translated, it means “the trail,” and it certainly is one. I spent an entire day winding my way down the long road of stalls checking out antiques and other cool Spanish wares, scoring some framed antique prints of the Spanish landscape for only a few dollars. Bangkok, Thailand: Chatuchak Weekend Market. This enormous market covers 35 acres of land and has over 15,000 stalls filled with goodies. I picked up some locally made wallets, coin purses, and other crafts to give to friends back home, plus stocked up on delicious smelling incense. Bali, Indonesia: Kuta Market. Bali is lively and laid back at the same time, and this market is no exception. I remember picking up beautiful scarves, handcrafted shoes, and indulgent coffee there. You can also find nice handcrafted wooden things there–I got a pretty carved container to put in my bathroom. Seoul, South Korea: Namdaemun Market. In Seoul there are two gigantic and famous markets, Dongdaemun and Namdaemun. Dongdaemun is larger than Namdaemun, but I always went to Namdaemun because it was closer to where I lived. You just have to walk around to get a VIP pass to Korean culture. Ajima (word for married or middle aged Korean woman) and ajasshi (Korean men) sold everything from pig’s feet to Korean health concoctions to clothing to furniture. London, England: Covent Garden Market. England has dozens of markets filled with wonderful things, but Covent Garden was my favorite. I went there pretty much every weekend while studying in London–it’s that addicting. You can find everything from gorgeous British antiques to funky jewelry to locally made Cornish pasties that melt in your mouth (savory pies filled with meat, cheese, vegetables, or other combinations, done like only the English can do). Buenos Aires, Argentina: Recoleta and La Boca Markets. Recoleta market is located next to Recoleta cemetery, where Evita Peron is buried, and has amazing local jewelry makers displaying gorgeous wares at every turn. I purchased a necklace made from a local stone, rodochrosita, that is pink with white streaks in it and that always draws compliments from friends. I’m wearing it today actually. La Boca market is in a neighborhood of Buenos Aires with super bright and colorful buildings. It was such a unique neighborhood that in the market I bought a framed picture of one of the buildings as a souvenir. Santiago, Chile: Santa Lucia Artisan Market. While in Chile, my mission was to find some lapis lazuli jewelry, and that was accomplished at Santa Lucia. The jewelry and other Chilean crafts were also quite impressive. I walked away with a pretty lapis necklace and keychain without spending that much. Rio de Janeiro, Brazil: Feira Hippie de Ipanema (Ipanema Hippie Market). This market, open on Sundays, is close to the world famous Ipanema beach and is so much fun to visit. You can scoop up precious stones at wonderfully inexpensive prices, fun crafts, locally made belts and purses, and tons of other things. And, of course, don’t forget to pick up a pair of Havaianas while you’re there. Moscow, Russia: Izmailovskiy Park. This is apparently the place to go for souvenirs in Moscow, and you can find everything from the famous Russian nesting dolls to replica Faberge eggs to Indian rugs. I tried Russian shaslik there for the first time and definitely recommend it (the Russian equivalent of barbeque). I also can’t forget the market that I frequent here in D.C. Eastern Market is located somewhat close to Capitol Hill, and it is a great place to hang out on the weekends. There are fun places to have brunch before browsing the jewelry, antiques, furniture, and so forth. Local farmers also bring fresh fruit and vegetables, and depending on the season it’s a great place to pick up items that aren’t as good at the grocery store. I love to stock up on locally grown apples, white peaches, and berries. Even though the financial markets are not doing so well these days, the economy of culture is thriving. It’s refreshing, for me at least, to take a break from discouraging economic news and enjoy seeing markets that aren’t so volatile. Markets provide millions around the world a chance to enjoy economics at its most basic–you either like an item or you don’t, you see if the vendor will come down on the price or won’t, and you buy it if you can or don’t if you can’t. It’s as simple as that. As many of you know, I spent two years in South Korea. After I finished graduate school in London, I felt compelled to gain more international experience and live abroad. My grandparents had been medical missionaries in South Korea during the 1970’s, and we still have family friends in Seoul. So, when I ended up moving to Seoul in October 2006, even though the country was radically different from my other travels, it was comforting to have people there who knew my family. My two years in South Korea were a time of personal growth, challenges, and learning. I worked at Seokyeong University, teaching English to university students, and volunteered at the Jayoutuh Center for North Korean Refugees. It was truly a life-changing experience to work hard to earn the friendship and trust of such resilient individuals who had escaped from such a brutal regime. At my farewell party at the refugee center, after spending two years with those amazing people, one of my North Korean students approached me and said, in broken English, “Kim Jung Il, he lie to us. Americans, you are friends.” Needless to say, I could not hold back the tears, even though I had lived in the stoic Korean culture for awhile. I left Korea with many friends whom I consider to be family, and we still keep in touch. I’ve been praying for them this week as news reports continue to come in about severe flooding and landslides hitting the Korean peninsula. I remember well “monsoon season” in Korea, when the rain just never seems to stop and you’re always walking around feeling drenched and windblown. My friends in Seoul appear to be okay this week, although their schedules are completely disrupted–many of them are posting pictures on Facebook of the heavy downpours that prevent them from leaving their apartments. Seoul has been hit by landslides, according to AP reports, as well as the town of Chuncheon (about 68 miles northeast of Seoul). According to news reports, at least 32 people have died amidst the crushing weather, and many more have been injured. South Korea is an incredible country, with a complex culture that reveals itself slowly, like the layers of an onion, and even then you’re still never quite sure if you’ve gained even a superficial understanding of it. I love the country and, even though I joke that it tried to kill me (I became very ill and ended up in a Korean emergency room, was unable to keep down solid foods, and lost about 12 pounds in one week) to make me prove my sincerity. I enjoyed my time there and will always consider a piece of my heart to belong to Seoul, and to the Korean people. I hope and pray that the pain and destruction caused by the recent landslides and flooding are soon alleviated. While living overseas for a few years, I managed to cross off most of the places on my travel “wish list.” I could have crossed all of them off, but I deliberately left a few on there. After all, part of traveling is working towards the goal of visiting somewhere–budgeting, planning, and making it happen. I wanted to leave some unattained goals to work towards later in life. I also wanted to leave a few places on the list to–hopefully–visit one day with my husband, whether on our honeymoon or a special trip with our future kids (yes, I’m planning on raising little Texan/Coloradan/internationally minded whipper snappers). Machu Picchu isn’t #1 of the places remaining on my travel “wish list,” but it comes in at a close second. (For those of you curious about the #1 place, well, some of you already know–but if you don’t, all shall be revealed in time). I first fell in love with Machu Picchu while studying and traveling around South America back in 2008. I loved Argentina, Chile, and Brazil, but I wanted to make a point to head up to Peru and see the incredible ancient Inca city that has long fascinated travelers. I couldn’t find anyone to go up to Peru with me, however, and my Spanish teacher at the language institute in Santiago, Chile, told me, “Mm, no es una buena idea que vayas sola alla.” It wasn’t a good idea for me to go there alone, she stressed, and even though I was dying to see Machu Picchu, I decided to keep it on the list and hope that whoever I married one day would go there with me. (I knew Leon was game when his response was to chuckle and say, “Of course you want to go there. Cool. We can hang out with the llamas”). 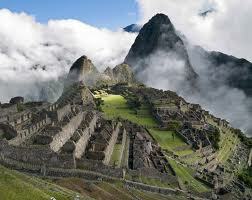 On July 24, 2011, Machu Picchu celebrated the centennial anniversary of its official discovery. Now, many historians claim that the city was discovered before 1911, but there is still a longstanding debate about when it was discovered and who discovered it. In the meantime, July 24, 1911, is the celebrated date. I didn’t know this, but a Yale professor named Hiram Bingham III is credited with discovering Machu Picchu and became the source of inspiration for the famous movie character Indiana Jones. Machu Picchu, even in pictures, is breathtaking. You can imagine the proud Inca people still there, cultivating the land with engineering genius that we wouldn’t have imagined to exist back then. Apparently archeologists still can’t figure out what the city was used for–some say that it was a royal estate of the Inca king Pachacuti, and others say that it might have been a sacred religious site. To get to Machu Picchu (not that I’m sketching out travel plans yet…), it does take effort. Machu Picchu is accessible from the city of Cusco, Peru, which can be reached most easily through Lima, the Peruvian capital. According to Peruvian tourism sites, it is best to take a three-hour train ride from Cusco to Aguas Calientes (also known as Machu Picchu Pueblo), then hop on a bus for about 20 minutes to the ruins. There are some really cool looking hotels to stay at in Aguas Calientes–According to Tripadvisor.com, the top ranked hotels to stay at while visiting Machu Picchu are the SUMAQ Machu Picchu Hotel, Inkaterra Machu Picchu Pueblo Hotel, and Machu Picchu Santuary Lodge. All are pretty pricey, so another option would be to stay somewhere in Cusco if you wanted to save more money to pick up some local Peruvian crafts. Happy anniversary to Machu Picchu–I hope to see you soon. I quickly did a news search and was saddened to see news reports that earlier today, Friday, July 22, 2011, a giant explosion happened in downtown Oslo. According to reports, one blast happened near Prime Minister Stoltenberg’s office, and another occurred close to the Norwegian parliament. So far Oslo police have not confirmed whether or not it was a terrorist attack, but they did tell reporters that at least one person is dead and several are injured. My mind raced to my friend Sonja, a close friend whom I had met at church in London during my graduate studies there. She is half Norwegian, half Northern Irish, and her family still owns property in Oslo. Sonja works in London, but since she often travels to Oslo and has family there, I sent her a quick text to make sure she was okay. It is always sad to see a place that you enjoyed visiting hit by tragedy. 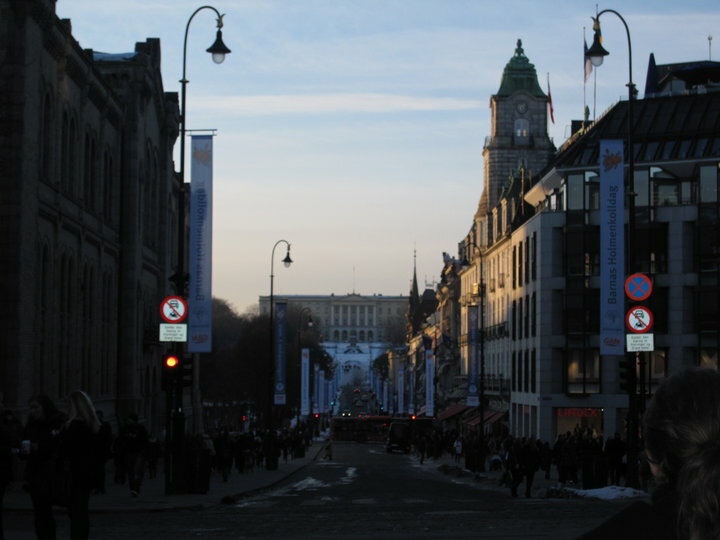 I visited Oslo almost exactly a year ago, during what you could call a burst of spontaneity. I had been in a bit of a slump at work, it was before Leon came into the picture and I had decided to take a break from dating, and I felt like I was lifelessly going through the motions of the D.C. professional routine. While chatting with Sonja and Julie, another close friend who is American but also lives in the U.K., on Skype one day, they mentioned that they were planning a girls’ weekend in Oslo. The plan was to get away, relax, and enjoy Sonja’s family’s flat in the city. I told them that their plan sounded amazing, and that I missed them and wished I could go. Now, as many travelers have experienced, before I knew it the “I wish I could go” somehow turned into, “Hm, I found a good deal on Expedia for those dates….” I knew that it was pretty spontaneous, but I had never been to Norway, and when else would I have the chance to visit friends there? Before I knew it, Sonja and Julie were clapping over Skype as I grabbed the tickets. And off to Oslo I went, for a long weekend. It was wonderful to see friends, of course, and having a girls’ weekend in a new country made it even more special. I fell in love with the calm yet vibrant atmosphere of Oslo. It is most famous for being the site of the Nobel Peace Center, but it offers so much more than just medals. My friends and I took a rail car up to Holmenkollen, home of the giant Olympic ski jump where we saw people training for the winter Olympics (or, as I saw it, flinging themselves down the slope at scary speeds). We strolled through the grounds of Akershus Slott (Akershus Castle), which sits on top of a hill overlooking the sparkling fjords that make for perfect photographs, and stopped by the visitor’s center to brush up on Norwegian history. After our history lesson, we headed downtown for some great shopping, coffee, and mouthwatering Norwegian smoked salmon (now, I’m not really a fan of smoked salmon, but I savored an entire plate of it there–another example of how sometimes you have to try a food where it’s from to appreciate it). During the weekend, aside from having girl talk, we explored the Oslo sculpture garden, took pictures in front of the royal palace, and had a mini snowball fight (it was snowing late for the season, so we took advantage of having fresh powder to make snowballs). It was a fantastic weekend. Oslo is a great city to visit, as it is less hectic than other European capitals, but it still has great history lessons to offer, great sights, and smoked salmon that will make you a fan even if you don’t currently like it. I hope that the Norwegian police are able to find the individuals behind today’s explosions and hold them accountable for creating tragedy in such a wonderful place.